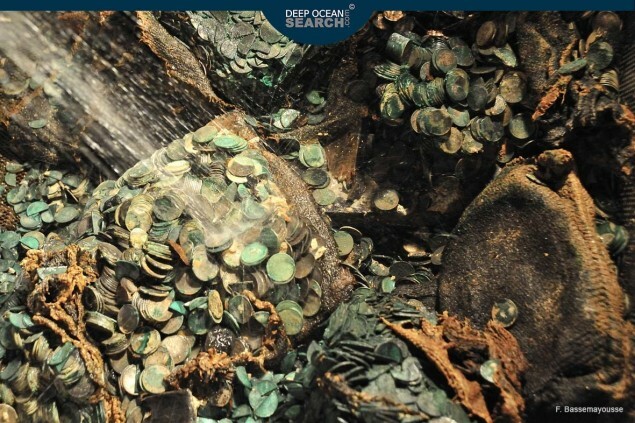 Deepwater salvage and recovery firm Deep Ocean Search says it has pulled “several tens of tons” of silver coins from a WWII shipwreck at a world record depth of 5,150 meters. The bounty is estimated to be worth a whopping $50 million, according to reports. The coins were found in the wreck of the SS City of Cairo, a mixed cargo and passenger ship that was sunk by a German U-boat as it sailed in the south Atlantic in 1942. The ship, belonging to Ellerman Lines, was on an unescorted voyage from Bombay to England, via Cape Town, when it was hit by two torpedoes and sank within 10 minutes. The SS City of Cairo was carrying 296 people, including 136 passengers, and a mixed cargo including some 100 tons of silver coins belonging to the UK Treasury. Of those onboard, 104 people died, including 79 crew, 3 gunners and 22 passengers. DOS began its search for the wreckage in 2011, and eventually found it broken in two pieces and covered in silt and mud approximately 1,000 miles from the nearest in the foothills of the mid-Atlantic ridge, DOS says. Under contract with the UK Ministry of Transport, DOS said it recovered several “tens of tons of silver coins” from a depth of 5,150 meters – a world depth record, according to the company. “Many items were seen on and around the wreck including the end section of the second torpedo, where the contra-rotating propellers could clearly be seen. Apart from the silver cargo this was the only item recovered from the site,” DOS said in a statement. The wreck was last dived in 2013 but the company’s findings have only now been revealed. This entry was posted in ship models and tagged navy ship, Salvage, WWII Ships. Bookmark the permalink.